In 2012-13 CuMMA collaborates with Pedaali Ry to create a seminar and publication under the title It’s All Mediating. The essays published in It’s All Mediating mostly derive from the international conference by the same name, held in Helsinki on 30th and 31st of May 2012. The conference focused on the two core functions of museums: exhibiting of the content (art or other cultural material) and educational activities directed to audiences. The conference was organised by the Finnish Association for Museum Education Pedaali, the Finnish Society for Curators SKY and the Curating, Managing and Mediating Art (CuMMA) Masters’ Programme at the Aalto University, together with the hosting venue Museum of Contemporary Art Kiasma. The conference speakers were invited to look at two sets of questions. On one hand, there was a quest to understand how the professional field is outlined at present: How do these two aspects—the responsibility to foster the content of the museum and the responsibility for its audiences and visitors relate to each other? 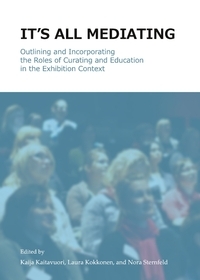 What is the division of labor between curators and educators? What kind of interests and values guide their work? What are the current models and what would be the ideal ways of organising their relations and collaboration? The other focus was on the individual level of how the specialists incorporate their roles: What are the specific skills of a curator or an educator? How (and why?) do we develop a professional identity? What is gained and lost in the process of specialisation? The invited speakers came from six different countries in Europe, and the over 200 participants and case study presenters represented 19 different nationalities. The speakers were Lindsey Fryer, Valérie Lagier, Maria Lind, Carmen Mörsch, Nora Sternfeld, Sally Tallant and Adela Železnik. Felicity Allen was later invited to contribute to the publication. The invitation to sit around the same table came from the museum educators’ side, which is reflected in the slightly stronger presence of educational voices. We consider this publication, however, as a start in an important dialogue and hope there will be many more occasions for cross- professional debates.